These days, garages aren’t merely a spot to park your car. Many Chicago area homeowners are turning them into extended living spaces. That’s why garages are being transformed into clean, functional areas by garage floor contractors. And it all begins with concrete flooring. Are you thinking of enhancing the value of your own home by updating your garage space? 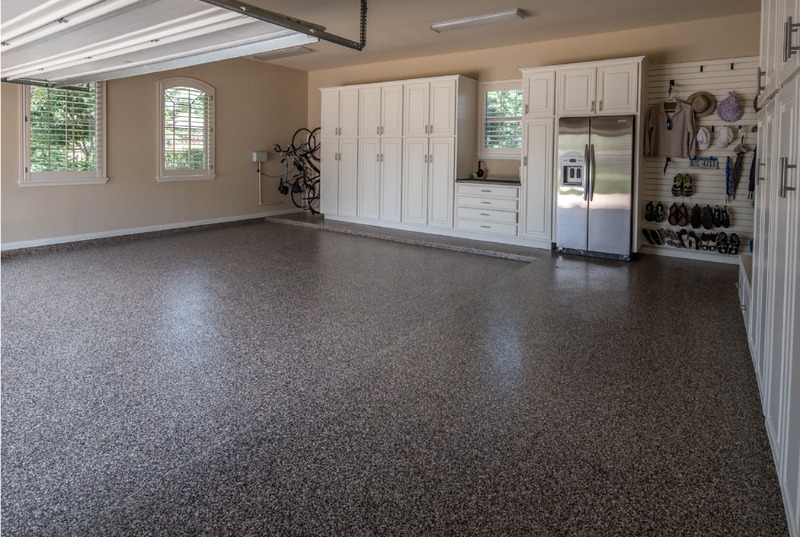 Maybe you think the condition of your garage flooring makes that impossible, and that any kind of concrete garage floor cost will be a nonstarter for you. Whether you want to turn your garage space into a showcase, or simply find a way to eliminate the embarrassment of an old, cracked, damaged or stained concrete floor, the garage floor contractors of Beyond Custom have the expertise and creative know-how to make it happen, and happen affordably. Based in Elgin, we proudly serve the Chicago area and surrounding counties an aim to be your first and final choice in garage floor contractors. Sealing and constantly resealing cracks, hiding oil stains and road salt damage, even being resigned to just having to live with uneven garage flooring are stop-gap measures you don’t have to put up with. The garage floor contractors of Beyond Custom will get rid of your old, worn flooring and replace it with a smooth, fresh foundation that presents endless possibilities and boosts your home’s value. A Beyond Custom garage floor has slabbing that is five inches thick and made of four-thousand psi concrete with fiber mesh. Steel wire meshing reinforces the floor that includes four to six inches of a compacted gravel foundation. And a vapor barrier and warranty are always part of the contract. There are several other basic, but essential factors that quality garage floor contractors observe when building a premium garage floor. Let’s take a look at some of them. How the Garage Floor Contractors of Beyond Custom Construction Get the Job Done Right. Site Prep. All responsible garage floor contractors know that this step is critical. We begin with the removal of your old garage flooring is removed and make sure it’s properly hauled off. The gravel sub base will be laid to exacting standards that ensure it’s even, that its thickness is right and that it’s compacted properly. These are essential measures that guarantee the finished floor will be smooth, its thickness uniform and its level consistent over the entire finished floor. But that’s not all a well-done grading does. It’s during this base work that the floor will have adequate pitch for proper drainage. Once the base is up to standard, steel wire meshing is cut, fitted and laid over. This mesh is positioned in the middle of the slab during the pour. Once this phase of the build is completed, your garage floor is ready for any municipal inspections. The Pour and The Finish. Your garage floor contractors get to work pouring the wet concrete and leveling it off. Once that’s done, a process called bull floating will ensure that any imperfections are eliminated, as well as compact the concrete for the finishing touches. The floor is then left to rest while all water still atop the floor evaporates, preventing the water from getting trapped in the concrete and weakening the surface. Once this phase is done joints are cut with a hand tool called a groover, preventing any ugly, arbitrary cracking. The floor is then hand finished with a steel trowel. 24 hours later you can walk across your new concrete garage floor. At this stage, we recommend that you apply a concrete sealer to your new floor. Sealing goes a long way in preventing stains, and in 7 days the floor is ready for cars or any other heavy objects that make your garage functional, attractive or entertaining. Before doing so, however, we recommend that homeowners apply a concrete sealer to prevent staining and corrosion from de-icers. How Do You Know If It’s Time For A New Garage Floor? 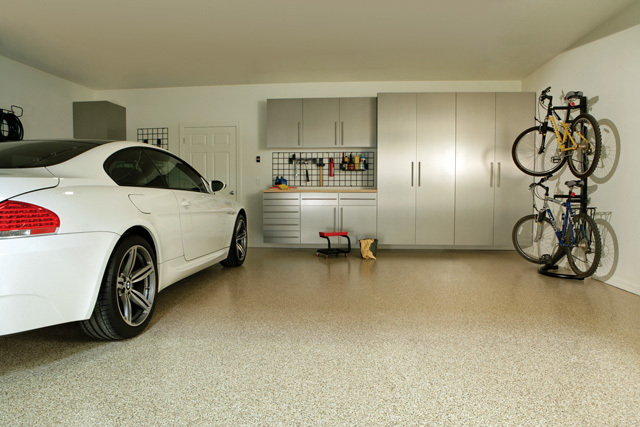 Beyond cosmetic ones, there are plenty of telltales that mean you need a new garage floor. Substantial cracks (those wide enough to slip a quarter into), sections of the floor are sunken or uneven or worn through to exposed stone, and standing water that doesn’t drain away properly are all signs that a new garage floor is in order. 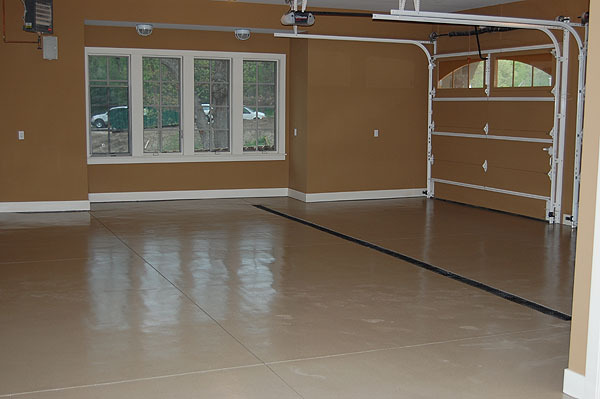 If you’re unsure, you can trust the garage floor contractors of Beyond Custom to give you an honest assessment. What Causes a Garage Floor to Fail? Pea Gravel Bases. Numerous garage floors in the Chicago area, particularly in the northwest neighborhoods, were built over twenty years ago using a pea gravel base. Because of its poor performance as a concrete flooring base, pea gravel has been outlawed as base material in the construction of garage floors. No legitimate garage floor contractors will work with pea gravel as a base. Improper Compaction. If the compaction process isn’t done right during the laying of the floor base, natural settling that occurs over time becomes uneven and can cause the floor to sink. The garage floor contractors of Beyond Custom know how crucial proper compaction is, and will not rush through this phase. Cracked Housing Foundations. Before you allow construction of your new garage floor, check the interior and exterior walls that surround your garage. If you find any cracks, these might allow water to leak into the floor’s base. During cold weather this might cause “frost heaving,” in which even small amounts of water can freeze and expand within the garage floor base causing cracking. If the leakage is significant enough, it may result in some of the base being shifted or eroded which can cause cracking or sinking. Poor Housing Sub Soil. If the earth deep under your garage’s flooring has high levels of moisture, the soil may expand significantly during when the weather drops below freezing. As time goes by, this seasonal contraction and expansion can cause pockets to form in the sub soil which, in turn, may cause your garage floor to sink or crack. Inadequate Control Joints Were Made During Floor Construction. Typically, two car garages have a horizontal joint down the center of the flooring as well as a vertical one, creating four identical squares. If too few joints where built into the flooring, or none at all, this can result in random cracking. Heavy Road Salt Damage. Road salts falling from tires and underneath the car’s body is sure to corrode and spoil a garage floor over time. 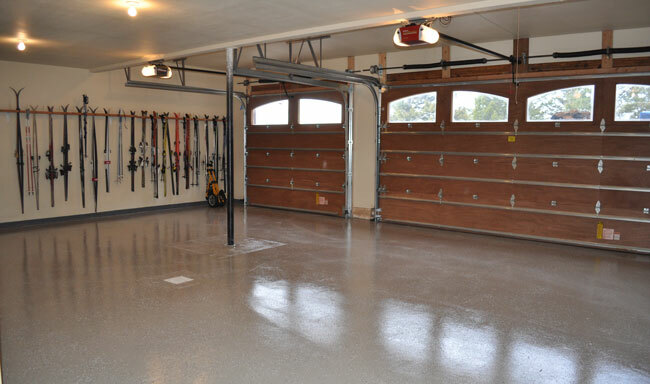 One of the main reasons we strongly recommend that homeowners maintain their new garage flooring with sealant. One of the best ways you can guarantee a long life for your garage floor is to make sure it’s built right in the first place. When you choose Beyond Custom as your garage floor contractors, you’ve chosen an expert team dedicated to your complete satisfaction. We know that quality, outstanding service and keeping a curb on your concrete garage floor cost are important to you. To us, they are priorities. Thank you for choosing Beyond Custom as your garage floor contractors.